This month’s lost kingdom is Gododdin in southern Scotland (early medieval northern Northumbria). This post just gets longer and longer and still seems incomplete, so hopefully it will do to give you a flavor of this lost kingdom. Gododdin is the one British kingdom that appears to have been conquered and annexed into Bernicia/Northumbria under King Oswald and his brother/successor King Oswiu. The Annals of Ulster records a siege of Edinburgh in 638, the middle of Oswald’s reign. It doesn’t record who won or if anyone was killed. Edinburgh would have been an impressive fortress and submission may have been as good as it got. Within months of Oswald’s death on 5 August 642, another battle was fought at Strathcarron east of Edinburgh between King Owain of Strathclyde and King Domhnall Brecc of Dalriada. The poem Y Gododdin records a victory stanza for Owain singing of Domhnall’s death. The Annals of Ulster then record a batte between Oswiu of Bernicia and the Britons immediately afterwards. Given the breath of Bernician battles we don’t know where these Britons were, but I believe this was a battle between Bernicia and Strathclyde over control of Gododdin. I think Oswald’s death set off a contest between all the major northern powers — Bernicia, Dalriada, and Strathclyde — over the prime territory of Gododdin controlling the entire southern shore of the Firth of Forth. There is no evidence that Gododdin itself was involved in deciding its own fate, suggesting that the native dynasty of Gododdin ceased to be under Oswald or earlier. It is possible that Gododdin was already the territorial possession of another kingdom, possibly the Britons of Strathclyde/Dumbarton. Dalriada is also a possibility as Aedan mac Gabran was credited with a victory over Manau Gododdin, the northern region of Gododdin, around Stirling. If Penda’s last seige of King Oswiu is correctly placed at Stirling (Urbs Iudeu), then the Gododdin would have been fully under Oswiu’s control by 655. Iudeu is the British name for the Firth of Forth. It is interesting to note that in Koch’s translation of Y Gododdin, he does find Oswiu’s name (Oswyd) in one of the elegies. It should be noted that Catraeth is also mentioned in a poetic elegy of Cadwallon of Gywnedd, who was slain by Oswald in 634. Makes me wonder if we have the dating of Catraeth so completely wrong. Needless to say if this is a reference to some action at Catterick that Cadwallon took part in c. 633-634, it is possible the same hero defended Edyn in 638. It is also possible that Oswiu was a major participant in the battle of 638 under his brother and his name is remembered as the final conqueror of Gododdin in his own reign. From Oswiu’s reign it appears to be securely under Bernicia’s control. 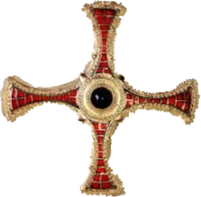 The Anglican diocese of Abercorn was in northern Gododdin to serve Pictland, so probably the edge of secure English territory in the early 680s. It seems likely that the majority of the former kingdom of Gododdin was securely in the diocese of Lindisfarne and the monastery of Coldingham was securely in Gododdin territory. Many of the battles with the Picts in the late seventh century were probably to protect Gododdin, now fully incorporated into Bernicia from Pictish encroachment. In Roman times this region, which may have also extended into what we now call Bernicia, was heavily settled. It was always a frontier region of the Roman empire and only under direct Roman control when the empire was extended to the Antonine Wall. There are numerous hill forts and major settlements throughout the region. Traprain Law was one of the longest occupied hill forts and from it was found the Traprain Law hoard, mostly Roman silver. It is thought that the British of the Gododdin were alternatively employed by the Romans and raiders of Roman territory as suited the times. Most of the great silver neck chains with Pictish symbols discovered have been found in the territory of the Gododdin. It is thought that these neck chains may have been inspired by Roman uniforms. Other hillforts that may have been within the area considered to be Gododdin include hill forts at the modern places of Edinburgh, Dunbar, Coldingham, Bamburgh, Yeavering (and Yeavering Bell). There are also Pictish symbol stones in the Gododdin territory, although these may have come in the post-Roman times. In some interpretations, Roman and immediately post-Roman Gododdin was a huge coastal kingdom that incorporated three territories: Manau (sometimes called Manau Gododdin, near Stirling), Lleuddinyawn (Lothian, Lleu’s territory), and Berneich (Bernicia). By this theory, Berneich/Bernicia was an area with some Anglican federates/mercenaries who settled just north of Hadrian’s Wall, eventually taking over that territory (perhaps in Ida’s time). Then by Oswiu’s time the territory of old Gododdin had been reunited into an expanded territory of Bernicia/Northumbria. The kingdom of Gododdin does survive today in the regional name Lothian. Linguists seem to accept the continuous development of the Roman era name Votandini to Gododdin and eventually to Lothian. Given that ‘dd’ in Welsh is the ‘th’ sound its really only shortened with the V-> G-> L transition. Y Gododdin is a collection of about 300 elegies that claim to be all by one person named Aneirin. It reads like a collection of elegies remembering the recently fallen. The overall frame claims that the elegies are all from the battle of Catraeth (probably Catterick) sometime in the 5-6th century. However, linguists are sure that it has at least three phases of elegies — an original level from Gododdin, second level from its transmission to Strathclyde/Dumbarton (where the Domnall Brecc death notice is added), and finally to Gwynedd where it was finally preserved in the Book of Aneirin. Even the original layer from Gododdin probably includes elegies from a wider period of time beyond just one battle at Catraeth. I’ll give you a few of these elegies here from Koch’s translation to give you a feel for them. The Gododdin takes its place in early British lore in several enduring legends. It is traditionally considered the home of King Lot of Lothian in Arthuriana. His original name was Lleuddun Luyddog of Dinas Eidyn and is said to have been buried at the ancient hill fort of Dunpelder Law. The main ancient fortress of Traprain Law is also said to be his seat. The name Lothian is said to derive from his name Leudonia, but of course as a mythical/legendary figure it was the other way around. He is also connected with the Welsh god Lleu. 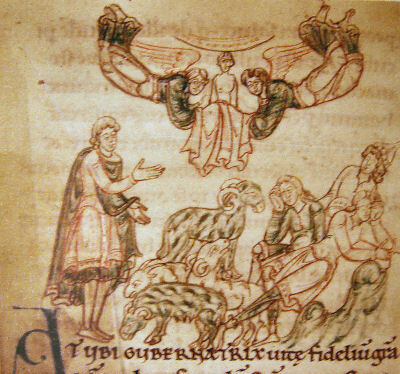 He is mentioned in a the oldest fragmentary life of St Kentigern as a half-pagan king who is killed by a swineherd. Jocelin’s Life of Kentigern claims that when Thaney was found to be pregnant with Kentigern, his maternal grandfather tries to kill his daughter by throwing her from the cliff of Dunpelder. When she survives this she is set adrift in the Forth of Firth/sea where she landed at Culenros where St. Sevanus was living. She gave birth and St. Sevanus baptized them both. St Sevanus raised and educated Kentigern until he moved to Glasgow, where he founded a monastery and later became bishop. Kentigern is the patron saint of Glasgow. Other various legends of Gododdin include the origins of Cunedda, founder of the first dynasty of Gwynedd, is said to have come from Manau Gododdin, a northern section that wraps around the head of the Firth of Forth, to North Wales (Gwynedd). This claim is first made in the Historia Brittonum from c. 825. It seems likely that this whole legend has been greatly influenced by the origins of King Merfyn, founder of the second dynasty of Gwynedd, on the Isle of Man (Manau). As the Historia Brittonum was written in his time, placing the founder of the first dynasty of Gwynedd in another Manau could have helped justify his conquest. If it unclear if the Scottish region of Manau (where Aedan mac Gabran wins a battle) was ever really part of Gododdin or if this is a later creation of Gwynedd. Thomas Owen Clancy, ed. The Triumph Tree: Scotland’s Earliest Poetry AD 550-1350. Canongate, 1998. Peter C Bartrum. A Welsh Classical Dictionary: People in History and Legend up to about AD 1000. National Library of Wales, 1993. John T Koch, ed and trans. The Gododdin of Aneirin: Text and Context from Dark-Age North Britain. University of Wales Press, 1997. With regards to the connection of Gododdin to Geunedota (Gwynedd) there has to have been some kind of tie regardless of whether the Cunedag (Cunedda) explanation is a legend or not, as the proof is in the poem itself: the men of Gwynedd fought along side the Gododdins. But why… and how? Why would a people of what is now North Wales travel to what is now northeastern England and southeastern Scotland to fight against the Angles and their British allies? More importantly, HOW did they travel there? Either the intervening kingdoms were friendlier than we realise or, possibly, Gododdin isn’t where we think it was! “Gwynedd’s folk will hear of his glory, Gwananhon will be his grave. Even the likes of Dumville and Koch et al don’t seem to pick up on this. So, either it was fought at the northern border of the Anglo-British territory or at the southern border, if it is indeed Catterick. Does this mean we’ve got the placing of the Gododdin all wrong? I don’t know, but it is a question I’d love to hear some answers to. We need to find Gwananhon. It seems to be a place-name rather than a description like Catraeth, which I have always though more likely to refer to a battle-shore (either sea shore or river crossing) than to Catterick. Do we know if anyone has looked for a place name like that? Kenneth Jackson (1969): ‘a region on the borders of Gododdin’. J. Lloyd-Jones (1963): plural of ‘gwanan’=’battle/campaign’. John Koch (1997): maybe a compound of gwan- (‘wounding’) with ant- (‘border’), meaning ‘violence at the border’ or ‘a place-name with Brittonic nant ‘stream’ is also possible’. More theories could probably be found…. I offer you Annan, which lies on the Solway, which might have formed the SW extreme part of the border of Gododdin at some time.. I offer it from sheer ruddy ignorance, mind. The battle of Catraeth became such a strong part of British mythology is metastasized off to other areas. I doubt that men from North Wales did fight in any original battle. Urien was also said to be Lord of Catraeth in at least one Taliesin poem, and so was Cadwallon in his elegy. It became a legendary battle that moved all over the place like Camlann, and also like Camlann people from many time periods came to be associated with it. Even if the site is Catterick, then I don’t see how that would be either a northern or southern border in the 6th century. Anglo-Saxon settlement was piecemeal both north and south of Catterick in the 6th century. I still like the theory that Catraeth was a border, a vast trench or fosse, or series of ditches/eathworks, running diagonally across the country. Then the British would travel fairly easily on one side of it and the various skirmishes that made the ‘battle’ could have occurred anywhere along this boundary between British and Anglish territories. It’s interesting that the famous 19th Century historian William F. Skene put Catraeth on the Firth of the Forth in the Manau Gododdin region. This at least puts it on a shore, and next to the Gododdin’s northern border with the Picts (and the Antonine Wall) but it doesn’t border with Brynech, which is who they are fighting, unless they came by sea, but there’s no evidence of that in the poem. I think the border is a river, rather than a ‘wall’ as there’s no mention of one in the poem. There is a river mentioned though, and that’s the Aled. Reading through the poem I don’t get any sense of riverine damp or mud. There’s lots of fighting in the fosse (which I translate to trench warfare) and firing of the furze (i.e., gorse bushes, which prefer dry sandy soils). I think we’re looking at moorland and hillside, not valley. p.s. a fan note: Mak, I loved ‘Babe’. The Anglo-Saxons most often mentioned are Deirans. Also there are frequent references to ramparts, ruling out a trench or long border. Ramparts are an assault on a fortified place of some sort. Catterick is important because it is such a vital link on the Roman road system and is close enough for there to be Deirans around. The Roman fortress at Catterick guarded the main branch of the Roman road system through the Pennine mountains. Rereading the elegy for Yrfai son of Wolstan above it reminded me of how similar the name Yrfai is to Yffe, one of the ancestors of the Deiran royal family. Odd…probably a coincidence. which John Williams translates as “If I had judged you to be of the tribe of Bryneich/Not the phantom of a man would I have left alive.” And this is the poet himself, Anerin, speaking. I haven’t counted the Deivyr vs. Bryneich references, but clearly the Bryneich/Bernicians were agreed to be Very Bad. I’m reluctant to give up the notion of the ditch/earthwork boundary. Rampart, according to the OED, is ‘a mound of earth raised for the defence of a place’. And very often made, in my opinion, from dirt throw up from a ditch. And if the ditch/wall/boundary was any length at all then it would have had forts dotted along it. Naturally, it’s lovely to think we could both be right–and we could be. The fight went on for days, back and forth. It could have happened at many places. can anyone explain scots dyke and whitcliffe scar? Govan, Scotland is a the location of an ancient monastery connected to the royal family of Strathclyde. I don’t know if the McGowan family had any connection to that site. I suspect the Kentigern material in the coat of arms may be a sign of loyalty to the saint. I don’t think this implies any blood ties to Kentigern or his family. No Owain the Bald is not related to the family of Rheged. Couple of minor corrections. Strathcarron is west of Edinburgh (not east). Traprain Law and Dunpelder Law are one the same. Dunpelder is just another (older) name for Traprain. It’s been a while since I’ve been here but firstly, thanks for the fan note from Nicola! There is one slight fly in the ointment with a northern placing of Catraeth (Katraeth) and that is Urien Rheged’s overlordship of it and the Battle of Gwen Ystrad (Gwen Valley). This battle is identified with Wensleydale, just south of Catterick, which makes sense if Catraeth is Catterick. However, it could simply be because of the supposed Catterick connection. If Catraeth is where Skene thought it to be, or on the River Tweed, for example, then a different location of Gwen Ysrad needs to be found. Winsterdale in Cumbria has been suggested, but this makes no strategic sense to me. This means trying to find a River White/Gwen/Wen/Finn somewhere near and, so far I haven’t been able to find any, unless Urien did travel all that way to Wensleydale or to the River Gwenfro near Wrexham, otherwise he’s have to go to the Isle of Sky to find a River Finn. There is another explanation: ‘Gwen’ is the name of the valley but, as mentioned in the poem, ‘Garanwynyon’ is the name of the rive (garan=heron+wyn=white+yon=?) which could, conceivably, be the River Carron (Scottish Gaelic: Abhainn Carrann) – near Falkirk… right on the border with the Gododdin. I tend to see Catraeth as a symbolic manifestation of a great “battle-shore” (ford beach etc) and can’t see it as a physical location, rather a bardic poetic ideal/vehicle. Y Gododdin; from lothian to north wales, however the transmission may have occurred, the theme of this work continued to develop over a period of time, presumably centuries, with additional heroic deeds and characters, attributable to the courts where this narrative (and possible oral tradition continuing in the kingdom centered on the Clyde as part of, possibly, the earliest transmission) found a later home. These later heros joining the great fallen before the host of Catraeth along the way, shields splintered & pierced, reddened by the blood of the enemy etc in payment for their lords hospitality, and commemorated alongside the great fallen heros from the north. Catraeth, if I’m not mistaken is not mentioned as a battle in any of the annals or slotted into any of the histories. Given the interest this body of work must have generated among the various interloping poets/scribes, the question has to be asked; why (is Catraeth as a place not mentioned outside of a few bardic poems with a brief mention in the triads; one of the three generous hosts of the island of britain; Mynydog and his host at Catraeth, if it was a historic battle, pseudo or otherwise)? If Koch’s idea that the more archaic B text can be further split into B1& B2 (B2 the more archaic) still holds water, specific translation/reconstruction aside, it seems that both Catraeth & the idea of a disastrous raid developed after the initial transmission or at any rate, after the demise of aristocratic patronage in the Lothians. Catraeth is mentioned only twice in Koch’s B2 strata, the frequency of occurrence increasing incrementally in the later material, B1 AB & A texts (21 further occurrences), by his reckoning. The concept of this tale being a catastrophic raid for the gododdin, where only 1 (or 3 depending on the stanza) survives to tell the tale also starts to emerge as a firmer theme, absent in the earlier B2 material. The idea that this battle must be historical is surely questionable and that Catraeth existed as a physical place or event must be challenged and approached from the other direction. Many, Koch included, seem to subscribe to the “historic battle” of Catraeth as an article of faith reminiscent of earlier scholars and the assumption of a historic Arthur. I think it safer to consider Catraeth as mythical rather than historical. As to King Lot I tend to see him as a the mythical deity given a pseudo historical roll in the ecclesiastical tradition of Kentigern/Mungo. As converting them pesky pagans seems to have been a tougher job than early church commentators/biographers have led us to believe and ecclesiastical method such as this has a history of being used by the early church in conversion. If we can allow Koch’s B2 texts translation of the opening B2 stanza, the invocation to “the rock/mountain of the people of Lleu” as a remnant of pre ninnianic/columban pagan court blessing or prayer, possibly used to introduce the poem recital in the hall/court (and gee up a little divine inspiration perhaps for the poet him/herself) then it may not be a tremendous leap to of faith to equate the reference to Mynydawc Mwynvawr (the wealthy mountain) in the Y Gododdin poems as a possible reference to King Lot/The God Lleu and some eastern traditional tribal lunasa hill, possibly Tino. Tolstoy in his “Quest for Merlin” makes a case for Heart Fell as a ancient lunasa hill using the work of Maire MacNeill in her book “The Festival of Lughnasa”. He identifies the Tweed Clyde & Annan as three rivers with sources rising from the flanks of Heart Fell as an indicator of Heart Fell being a likely contender according to MacNeill’s study. Did the Britons of the west share this site or would the Britons of the east have their own? Or were the features associated with the Irish sites applicable to the Britons? This will need to wait until I can get home to find a map but I’d hazard a guess at the Almond, The Water of Leith and Tyne Water/9 mile burn/Braid burn etc… for Tinto. Sorry, not Tinto, my mental map has failed me and Tinto is further south than I remember, unfortunately the online map I found doesn’t name the western pentland tops I fancy as contenders.